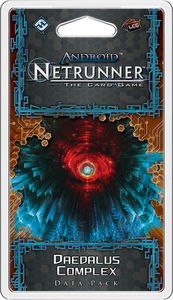 After previous Data Packs have explored the game's cyberstruggles with the settings of Luna, SanSan, Mumbad, and a New Angeles wracked by economic chaos, Daedalus Complex, the first Data Pack in the Red Sand Cycle for Android: Netrunner, turns our attention to Mars. There, terraforming is already well underway, and millions of humans live alongside clones and bioroids in a handful of cities and nodes protected by transplas domes. With sixty cards (three copies each of twenty different cards), Daedalus Complex explores the ways that life on the Red Planet is markedly different than life on Earth. On Mars, it requires a certain ruggedness to live and work. Simply traveling outside of the protected cities requires breathing assistance and protective gear. The shared hardships of survival have led to the de facto authority of the clans, and even though the Martian Colony Wars have ended, the tensions between the clans, the Martian Colonial Authority, and the corps remain high. Mine these conflicts for change or profit with Daedalus Complex. Mars very much remains a semi-lawless frontier… and any given spark has the potential to ignite a much larger flame.